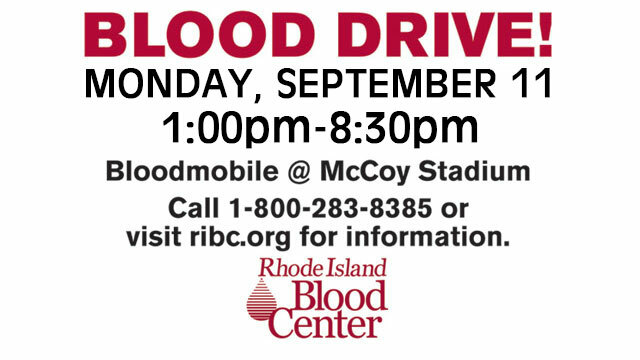 For the second year in a row, the Pawtucket Red Sox and the Rhode Island Blood Center are teaming up on September 11 to host a "Day of Remembrance" Blood Drive in the Visiting Clubhouse at McCoy Stadium. The drive will take place from 1:00pm-8:30pm, and fans who donate blood will receive a $5 Dunkin' Donuts Gift Card and a PawSox Baseball Cap. Last year on the 15th anniversary of the 9/11 terrorist attacks, members of the PawSox community set a club record by donating 71 units of blood for the Rhode Island Blood Center at McCoy Stadium. PawSox blood drives in past years had garnered less than a dozen units. "It's important for more people to begin donating blood and try to give as often as possible," said Kara LeBlanc, Communications Manager of the Rhode Island Blood Center. "Unfortunately, we live in a world where disasters happen too frequently. Because blood donations take two days to test and process, it is the blood on the shelves from regular donors that save lives."